Collective responsibility is dead! Long live collective responsibility! I've been wittering on about for this time (see, for example, here). But I think this week's Question Time confirms (finally) that the conventions around collective responsibility have evolved again. We have new operating arrangements governing the expression of dissent by Ministers of the Crown. Under MMP we have seen the incremental loosening on the unanimity element of the convention of collective responsibility. But, responding to questions about public remarks from Ministers Hide and Sharples about the independent Māori statutory board for the Auckland Council, Prime Minister indicated – whether consciously or not – that the present government is operating under even looser arrangements than before. The Prime Minister condoned deviations from the existing "rules" about collective responsibility recorded in the Cabinet Manual. That probably means that the underlying convention has evolved and that the Cabinet Manual rules will need to be re-written to reflect the new operating arrangements. New Zealand could and should easily become a republic, says Dean Knight. MOVING to a republic involves changing our head of state from a hereditary monarch based abroad to a local, chosen by us. The easiest path is to simply promote the governor-general from being our de facto head of state to a real head of state. Same powers, same functions, same duties, some Treaty obligations, same House - even the same name if we wish. Oh. I should mention that, for a while, blog posts will be despatched from new headquarters - from London. 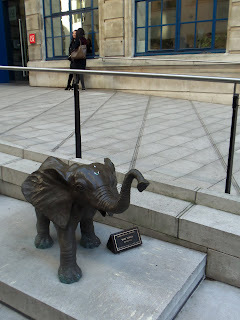 They have elephants here too, including one in the main street of the university (see photo). Constructing and deconstructing the EPA? I was interested to hear of the government's proposal to merge and reconfigure the government departments to reduce the size of the public service. The announcement prompted me to recall a tender advert from the new Environmental Protection Agency I noticed in newspapers just before Christmas. I'll get to that in second.